Cumulative Bounce/Lag Momentum gains are now at 50.31% so far in 2019. Last week, the S&P 500 Index gained 1.2%, while the five B/L Momentum picks gained an average of 6.33% when tight stop-loss orders were applied. Next week’s BLM picks using the Bounce/Lag Momentum Ratio include VCYT, AEZS, BDSI, NEO, and CYBR. Of these, only VCYT is a returning pick from the previous week. Key DOW 30 stocks for this coming week are Cisco, Procter & Gamble, Visa, and Merck, based on composite momentum and overbought/oversold analyses. This is a special contribution article by Prof. Grant Henning based on his published research on the BLM technical theory. The model, his 2% trailing stop-loss approach, and comments are expressly based on his own proprietary methodology and forecasts. The Bounce/Lag Momentum algorithm continues to be an effective stock-picking guide. 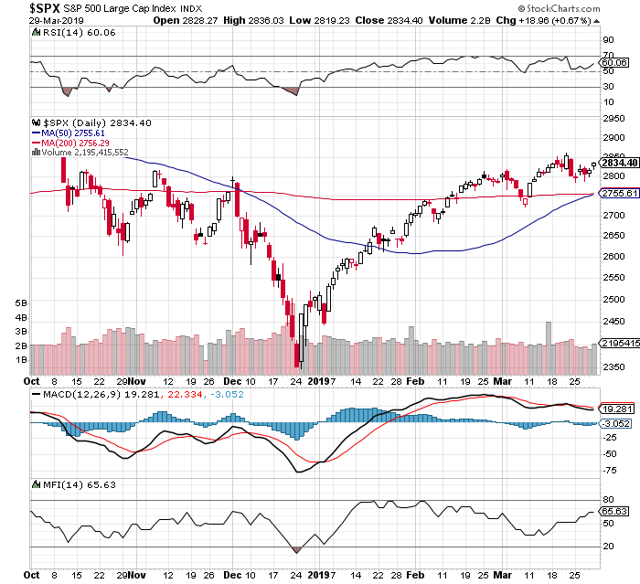 It is essentially a numerical derivative of the ratio of the percentage bounce from the 52-week low to the percentage lag from the 52-week high. As such, it is a sensitive positive momentum measure that works well to identify stocks that are at the upper half of their momentum trajectory. Bear in mind, however, that there is much more to successful trading than merely picking good stocks. I suspect that finding good stocks is only about 40% of possible success in equities trading. The remaining 60% is determined by money management and capital preservation. Decisions about entry and exit points and how long to hold a position are especially important. In today's volatile marketplace, "buy-and-hold" strategies are unlikely to be successful. Therefore, although I am offering weekly stock picks, this should not be interpreted as a recommendation necessarily to buy all of these stocks, nor to hold the stocks for an entire week. This is also why I often use trailing stop-loss orders throughout each trading day. Although the Fed now promises no future rate hikes for the remainder of the year, the Mueller investigation is finally over with no disruptive conclusions, and there are still hints of a trade deal with China, it now appears that the European economic slowdown is still weighing on US markets, and the overall US debt continues to escalate. My favorite indicator of market conditions is the ratio of relative strength over money flow, where values above 1.00 are considered a positive portent of market conditions, and below 1.00 are considered a negative indicator of market conditions. For last week, at this time, that ratio stood at 1.03 for the S&P 500 Index. For this coming week, it has fallen to a negative 0.915. I interpret this as a strongly negative indication for the near term. However, there are some competing positive indicators. This past week, the S&P 500 Index gained 1.20% for the week. You can see from the chart below that the S&P 500 Index has bounced off its 200-day moving average, which is technically a positive development. Furthermore, the 50-day moving average is now at last crossing above the 200-day moving average, suggesting that the positive trend is still in place. Last week's five stock picks gained an overall average of 6.33% on the week. However, as the table below illustrates, this positive performance was possible only by using 2% trailing stop-loss orders. Otherwise, the overall averages showed a loss of 1.57% for the week. This underscores the need for a well-defined exit strategy in order to maximize success. During the same week, the S&P 500 Index gained a total of 1.20%. *A word is needed about the use of stop-loss orders. Formal stop-loss orders provide a temptation to market makers to "take out the stops" when there is little trading volume. Therefore, it is often better to set a mental sell price and execute it when the market reaches that point. Several of you have accurately noted that some of the picks that trigger a stop-loss sell return to favor within a few days. Therefore, it can be more profitable at times to avoid stop-loss sales altogether. In my personal trading style, I tend to err on the side of caution by preferring to suffer a small loss and to repurchase the same stock later than to suffer a large loss if the stock falls and does not return. Note that this just a matter of personal trading style, and it does not work well at all times for all persons. Another reason for possibly using stop-loss orders for these picks is that they all have already had big momentum moves and are somewhat "long in the tooth." The BLM method identifies stocks with positive momentum only after they approach their 52-week highs. Thus, they are often vulnerable to sudden downturns, and then capital preservation becomes a more serious issue than with picks made using other trading strategies. As you can see in the above chart, where the vertical y-ordinate represents percentage gain and the horizontal x-axis depicts number of weeks, the Bounce/Lag Momentum stock picks have more than tripled the performance of the S&P 500 Index. 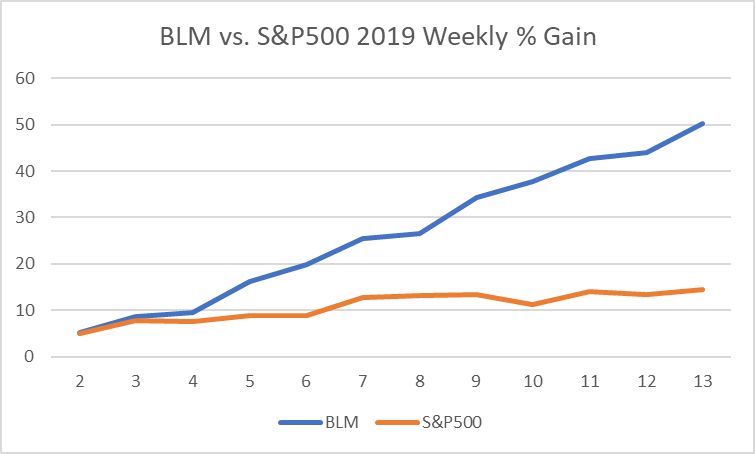 BLM 13-week composite gains of 50.31% compare favorably with S&P 500 composite gains of 14.56% and have exceeded my strategic objective of 10% per month. While past performance is no guarantee of future gains, I remain optimistic going forward. Please note also that I am not troubled by the seemingly high turnover rate occasioned by the use of stop-loss orders. An untold secret is that the proceeds from the early sale of those stocks can be applied elsewhere to produce gains not reflected in my cumulative gains statistics. 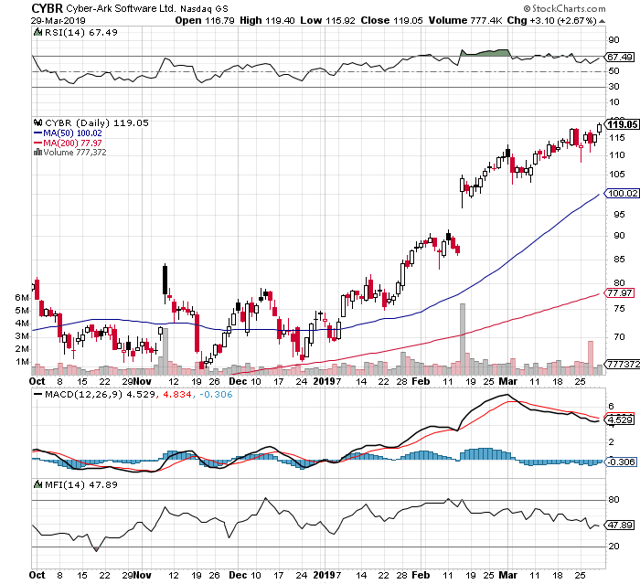 For next week, the Bounce/Lag Momentum algorithm has identified the following five picks: VCYT, AEZS, BDSI, NEO, and CYBR. VCYT is a returning pick from last week, when it was the only pick with a qualifying BLM score above 30. Note that a BLM score above 30 is normally required to qualify as a weekly pick. The following table reports actual BLM scores and combined rankings for these stocks. Charts of all of these picks are available below. You can see from the following charts that all of these stocks are experiencing upward momentum surges and are reaching new annual price highs. However, it is precisely for those same reasons that extreme caution is warranted in each case. 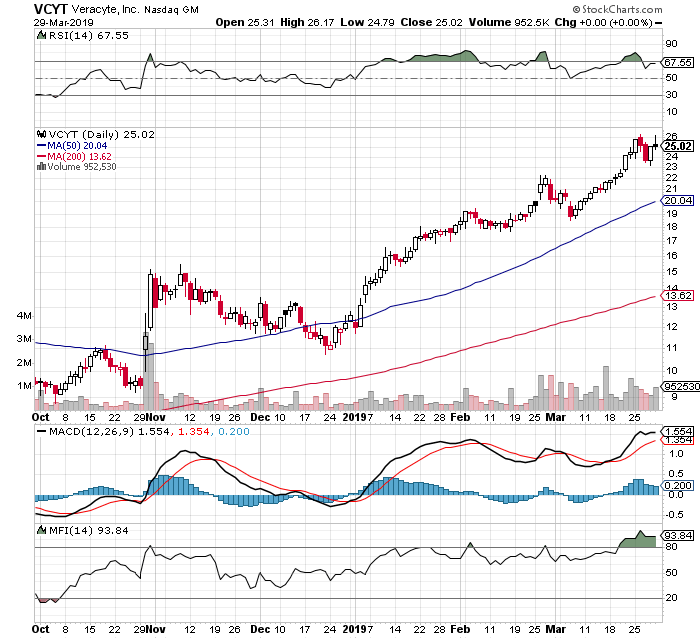 Veracyte, Inc. is a genomic diagnostics company. The company uses genomic technology to resolve diagnostic ambiguity. It targets diseases in which patients undergo invasive diagnostic procedures. Its products combine genomic technology, clinical science, and machine learning. The company commercializes over three genomic tests, which are transforming the diagnosis of thyroid cancer, lung cancer, and idiopathic pulmonary fibrosis. The company's commercial solution, the Afirma Thyroid fine needle aspiration Analysis, centers on the Afirma Gene Expression Classifier. The Afirma GEC is offered directly or as part of a solution that also includes cytopathology. The company operates in the pulmonology diagnostics market. It offers Percepta Bronchial Genomic Classifier, a genomic test to resolve ambiguity in lung cancer diagnosis. It also offers the Envisia Genomic Classifier, which is designed to help in the assessment of patients suspected to have idiopathic pulmonary fibrosis. 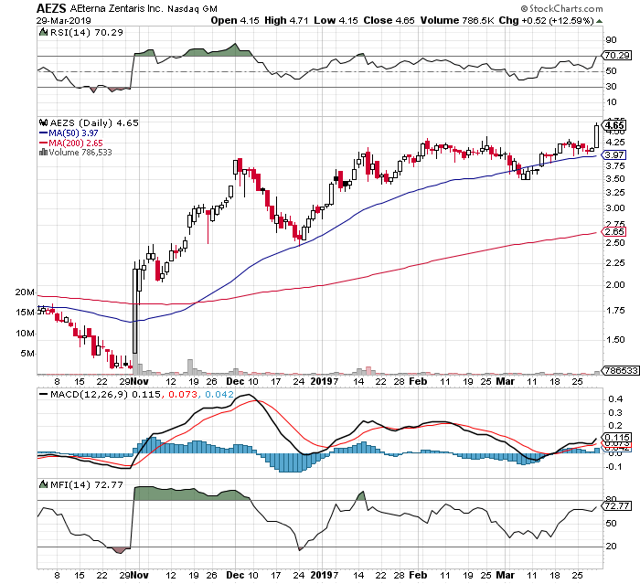 Aeterna Zentaris Inc. is a specialty biopharmaceutical company engaged in developing and commercializing treatments in oncology, endocrinology, and women's health. 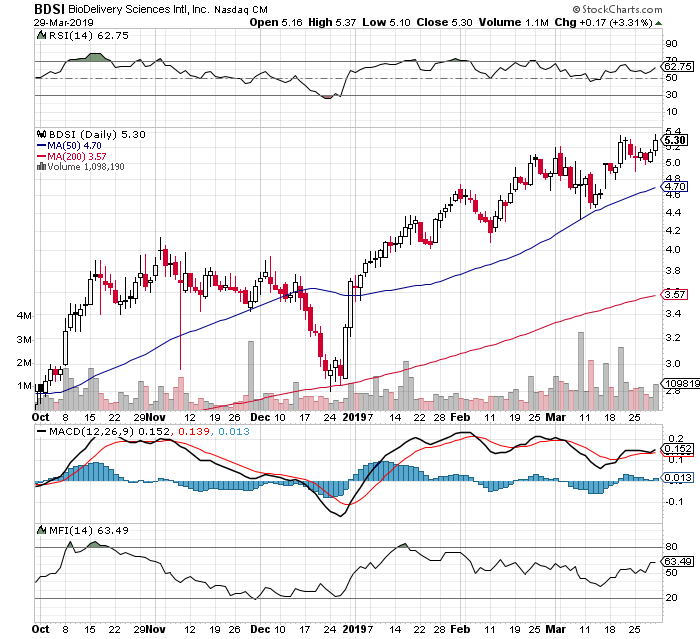 The company operates through the biopharmaceutical segment. The company is engaged in drug development activities and in the promotion of products for others. The company's principal product candidates are Zoptrex (zoptarelin doxorubicin) and Macrilen (macimorelin) in oncology and endocrinology. The company focuses on its product candidates Zoptrex and Macrilen, which are in Phase III clinical development, and on a luteinizing hormone-releasing hormone (LHRH)-disorazol Z conjugate (AEZS-138), which is in pre-clinical development in oncology and is available for partnering. The company's direct and indirect subsidiaries include AEZS GmbH, Zentaris IVF GmbH and Aeterna Zentaris, Inc.
BioDelivery Sciences International, Inc. is a specialty pharmaceutical company. The company develops and commercializes, either on its own or in partnerships with third parties, applications of approved therapeutics to address unmet medical needs using drug delivery technologies. The company develops pharmaceutical products aimed principally in the areas of pain management and addiction. The company's products utilize the BioErodible MucoAdhesive (BEMA) drug delivery technology, a small, erodible polymer film for application to the buccal mucosa (the lining inside the cheek). The company's United States Food and Drug Administration (FDA) approved product, ONSOLIS (fentanyl buccal soluble film), as well as its approved products BUNAVAIL (buprenorphine and naloxone buccal film) buccal film and BELBUCA (buprenorphine) buccal film, utilize BEMA technology. 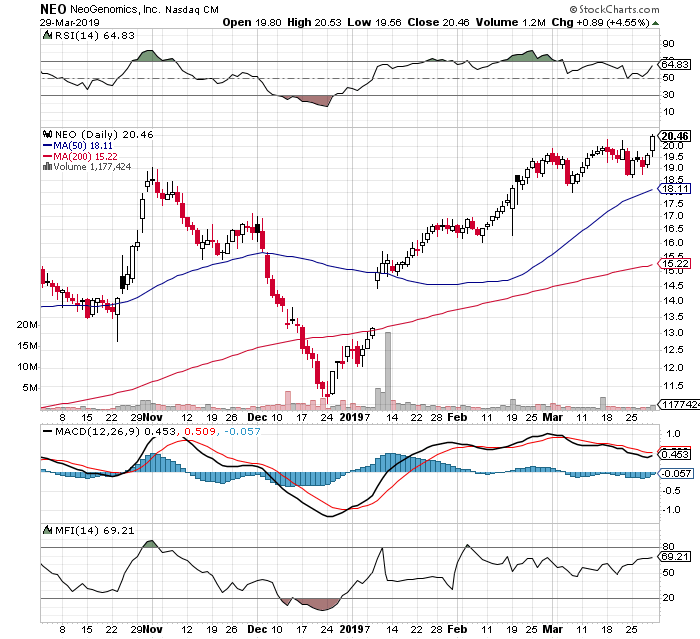 NeoGenomics, Inc. is an operator of a network of cancer-focused genetic testing laboratories. The company operates in Laboratory Testing Segment. This segment delivers testing services to hospitals, pathologists, oncologists, other clinicians, and researchers. It has laboratory locations in Ft. Myers and Tampa, Florida; Aliso Viejo, Fresno, Irvine, and West Sacramento, California; Houston, Texas, and Nashville, and Tennessee. It offers testing services, which include Cytogenetics, Fluorescence In-Situ Hybridization (FISH), Flow cytometry, Immunohistochemistry (IHC), Molecular testing and Pathology consultation. Its Pharma Services and Clinical Trials group provides testing services in support of its pharmaceutical clients' oncology programs from discovery to commercialization. It helps its customers develop a biomarker hypothesis by recommending an optimal platform for molecular screening and backing its discovery tools with the informatics to capture meaningful data. CyberArk Software Ltd. is an Israel-based provider of information technology security solutions that protects organizations from cyber-attacks. The company's software solutions are focused on protecting privileged accounts, which have become a critical target in the lifecycle of cyber-attacks. The company's Privileged Account Security Solution consists of various products, such as Shares Technology Platform, Enterprise Password Vault, SSH Key Manager, Privileged Session Manager, Privileged Threat Analytics, Application Identity Manager, CyberArk-Conjur, Endpoint Privilege Manager and On-Demand Privileges Manager. The company's products provide protection against external and internal cyber threats and enable detection and neutralization of attacks. The company's Enterprise Password Vault provides customers with a tool to manage and protect all privileged accounts across an entire organization, including physical, virtual, or cloud-based assets. Many readers are especially interested in large-cap, low-risk DOW 30 stocks that experience low volatility and may also pay dividends. Dow 30 stocks also offer opportunities for options traders. Traditionally, I have avoided these stocks because they do not usually produce my targeted 10% monthly growth. Recently, however, there have been some exceptions. Also, it is apparent that there are safety advantages in popular large-cap stocks during periods of market volatility and potential downturns. However, most Dow 30 stocks do experience significant downturns in lengthy periods of market decline inasmuch as these stocks are highly correlated with overall market performance. Last week's Dow 30 picks had mixed performance based on sector trends and company idiosyncrasies. Merck (MRK) gained 1.07% on the week, while Verizon (VZ) lost 1.05%, and Apple (AAPL) lost 0.58% during the same period. Cisco Systems has registered year-to-date growth of 20.44%. It is currently the number two DOW 30 stock in combined-ranks momentum. Its Bounce/Lag Momentum score is only 6.86, which is lower than above-listed stocks but ranks 4th among DOW 30 stocks. Using a combined-ranks statistic including momentum, growth, and overbought/oversold analysis, we can see that CSCO now ranks first among the DOW 30 stocks. Procter & Gamble has gained 12.43% so far this year. However, its combined-ranks momentum is number one among all DOW 30 stocks. Its Bounce/Lag Momentum score of 9.45 is in 2nd place among all DOW 30 stocks. Its combined-ranks momentum, growth, and overbought/oversold position have it tied for second among all DOW 30 stocks. Visa has gained 15.87% so far this year. Its combined-ranks momentum is number four among all DOW 30 stocks. Its Bounce/Lag Momentum score of 6.95 ranks third among all DOW 30 stocks. Its combined-ranks momentum score is fourth among DOW 30 stocks. It is tied for second place with PG in its combined-ranks momentum, growth, and overbought/oversold position. Merck continues to be the DOW 30 stock with the highest Bounce/Lag Momentum score of 11.21; however, its year-to-date percentage growth has been only 8.12%. Its combined-ranks momentum, growth, and overbought/oversold position has it in fourth place among DOW 30 stocks. Its annual growth of 57.4% from its 52-week low is highest among all DOW 30 stocks. Although these mega-cap DOW 30 stocks tend to fall short of my 10% monthly growth target, they do have some safety advantages for the long term. Those who are risk averse may prefer such stocks. After the first three months of 2019, I was pleased that my BLM strategy gained over 50% in that same period. Imagine my surprise to discover that it would have been possible to exceed that performance with much less effort by leveraging any one of the six DOW 30 stocks that exceeded 15.8% growth since January 1st of this year. Those stocks in descending order included CSCO, IBM (NYSE:IBM), United Technologies (NYSE:UTX), AAPL, Exxon Mobil (NYSE:XOM), and V. "But", you ask, "How are such gains possible with large-cap stocks that show such slow growth?" The answer lies in strategic use of margin leverage. Fully margining those stocks through your brokerage account causes percentage gains to increase by a factor of 3.3. That means that a stock like Cisco Systems, that gained 20.44% in the first quarter of 2019, would in reality have gained 67.45 % in your account. But what about margin interest? Well, the industry average for margin interest stands at 10%. For one quarter of the year, you would have been obligated to pay a total of 2.5%, leaving you with only 64.95% gain. But wait, CSCO pays a 2.59% annual dividend, and the ex-dividend date is April 4th, which more than covers first quarter interest. I mention this strategy for the benefit of those who do not have time to monitor intraday market performance and who dislike high commissions associated with high portfolio turnover. Of course, this strategy includes other kinds of risks. For example, four of the DOW 30 stocks (UnitedHealth Group (NYSE:UNH), Coca-Cola (NYSE:KO), Pfizer (NYSE:PFE), and Walgreens Boots Alliance (NASDAQ:WBA)) actually lost growth in the first quarter of 2019, which amounted to minus 7.32% for WBA. The same 3.3 factor means that you could have lost 24.16% by choosing the wrong stock to margin. In spite of these risks, some of you may be interested in exploring this different strategy. Although the BLM algorithm is a proprietary analytical procedure that is the end result of years of statistical analysis, much of its conceptual design is described in my books listed below. However, it currently involves the maintaining of a 100-column spreadsheet with daily updates, including inputs from an AI expert system and a regression residual analysis. Use is made of rank statistics in the belief that a trader should not only find good stocks but should also have a means of comparative ranking of those stocks. Computations proceed throughout each trading day, but these results are posted weekly through this medium. If you have any further questions about the Bounce/Lag Momentum stock-selection procedure, you can probably find the answers in my books referenced below. Best wishes in your trading decisions. My last article is available at the link below, and each set of weekly stock selections are updated on the live tracking spreadsheets and V&M Dashboard available to members under the Tools section.